It’s been awhile since I did a Book Report, and I’d like to make ’em a semi-regular thing on the blog, so here we go. My latest & greatest Book Report is from a Canadian author…and here’s five must-know things about the story, and the talented author. What’s the buzz? : This debut novel by Canadian writer Matt Lennox originally came out in February 2012, but the paperback edition just hit shelves last month. The book has racked up some positive buzz for two reasons. One, Lennox’s background as a Captain in the Canadian Forces isn’t exactly your typical career path to become a published author. Two, those in the know were already looking out for Lennox’s first full-length work; his collection of short stories had already been shortlisted for some prestigious writing prizes, including the 2010 ReLit award. What’s the story? : The story essentially shifts around the perspectives of three men whose lives intertwine in an increasingly tangled and dangerous web. It’s right at the beginning of the 80’s and we’re in small-town Ontario. Leland King has just served seventeen years in prison – the crime itself is a mystery for most of the book – and is returning home to be with his mom in her dying days. As much as he tries to follow the straight and narrow path, Lee’s reputation ultimately pushes him in the direction of illegal activities. His nephew, Pete, is a high school dropout that has fallen hard for a local girl with a much better reputation than he could ever hope to match. Despite the differences between Pete and his crush (and the crew of guys from a rival school that seems to constantly want to rumble with him because of said crush), Pete actually comes off as one of the most sane, balanced characters in the story. Coincidentally enough, a retired police officer named Stan Maitland happens to be his crush’s grandfather and the same fellow that drove Lee to the prison all those years ago. Stan’s on the hunt for a somewhat cold case after coming across a body in an apparent suicide – a case that may actually lead him back to both Lee and Pete. So, what makes it worth reading? : One of the most-talked about aspects of Lennox’s work is the writing style; it’s extremely minimalist. Despite the 400+ pages in this book, you rarely feel like a word is wasted. Lennox has already earned comparisons to the likes of Ernest Hemingway – if you’re a fan of the spartan yet somehow descriptive style found in classic works, you’ll probably dig this taut, cleanly paced novel. Is it a mystery? A drama? A thriller? : Truth be told the book fluctuates a fair bit. For the first 100 pages or so it’s really a character-based, family drama. The two main hooks of the novel are where is Stan’s investigation going? and what did Lee do? As the novel gets deeper, the questions start to pile up, namely in terms of the outcomes for all involved. The mystery component isn’t a huge part of the story – I’d say it’s more on pace with a thriller. Tonally, it actually reminded me a lot of films like Fargo and The Lookout. Who should read this book? : If you’re looking for a refreshing slice of Canadian Lit, look no further. Lennox’s book certainly feels Canadian in some elements, and the 80s setting is an unusual choice – it’s fun to read a book without the technological advances we all take for granted, and Lennox paints a vivid picture of the small Ontario town where the story is set. I’d also recommend it to folks looking to step up their mass market mystery book reading; Lennox’s book packs quite a bit of action, violence, and tension, but with much, much deeper attention paid to character-building. 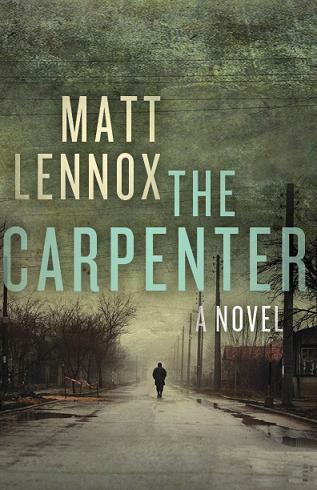 1) Leave a comment by April 2nd on why you’d like to read Matt Lennox’s celebrated book, The Carpenter. 2) Entries are limited to one per person / per email address / per household (or more if you score bonus entries). A random draw will be conducted on or around April 3rd to select the winner, who will have 48 hours to respond before another winner is chosen in their place. 4) Bonus Entry: Like HarperCollins Canada on Facebook and leave a comment about The Carpenter to earn yourself a bonus entry! Be sure to leave a link back to your comment or your FB username in the comments below so I can credit you! This book looks interesting. I love canlit and this would be a great addition to my tbr pile for my 50 book pledge! I’d like to win this book because, first of all, it sounds like a good story and secondly, it sounds well-written. I hate those flow-y descriptive passages that some authors put into their work. Huge mystery fan who would love to read this book. I’d love to read The Carpenter because I have very poor book-choosing skills! I’ve found some of my favourite books by accident but when I pick them myself I often don’t enjoy as much as I would like too. It does sound like a fun book to read. Thanks for the book report. Love anything by Matt Lennox. I’d like to read The Carpenter because I’m always looking for new Canadian authors. I’m a child of the 80’s which really appeals to me as well as the novel being a thriller. I enjoy Canadian authors – especially mysteries. I have head so many great reviews of this book and would dearly enjoy to read a copy. TY! I would be winning this for my 17 year old daughter who has been reading novels since she was 10! She has a facination with reading and goes through 4 novels a week. I would love to surprise her with one just to show her how proud I am of her, as reading in teens now of days is hard to find. Thanks for the chance ! I am intrigued with the mystery of crime and even more so because of it’s location in Ontario.This book sounds like a must read so I really hope to win it.THX. I have not read a book by this author, I like to read Canadian books, I enjoy suspense novels. I would love this book because it is about small town Ontario and crime and redemption. I also liked HarperCollins Canada facebook. I am a passionate reader (as you know), so would love to add this new Canadian author to my list and The Carpenter to my bookshelf! Thanks for the chance to win this book. I’ve posted on Facebook too. This sounds like a very interesting book-the fact that it has a Canadian author is a plus. I love that it is Canadian!!! I’d love to win this book. It sounds like it’s right up my alley for content, ie: I love a good mystery, a good thriller but also a good character driven book. I would like the opportunity to read this book because it is a Canadian story written by a Canadian. That always draws me in. Also your great review has me wanting more. Commented on Harper Collins fb page. I am interested because I live in Ontario and I love to explore books by Canadian authors. I like on facebook and commented. The minimalistic approach to the authory’s style sounds intriguing. Thanks so much! This book looks like a good read. I love that it’s set in Ontario, yeah, Canada! ‘The Carpenter’ looks to be suspenseful and escapist, which would make for a great getaway read. I would love to read this book as I love a good mystery. I love to support Canadian authors as well. I love a good mystery too…look forward to reading The Carpenter. Thanks! This is for me. Have been a closet carpenter all my life.Love carpentery and should have as a female gone into this career. I love mysteries so I’m sure I’d love to read The Carpenter. If he writes anything like Earnest Hemingway I would want to peruse this.